Stunning Platinum Three Stone princess diamond engagement ring. This diamond engagement ring is set with 1 full carat SI 1 clarity G-H color diamonds. 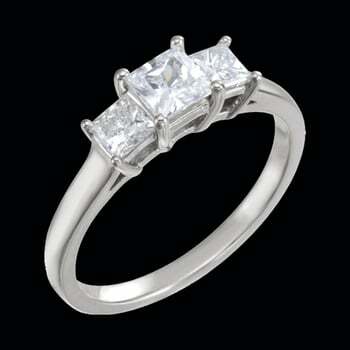 Center stone is a 1/2 carat accented either side with a 1/4 carat diamond for a 1 full carat total. See this rings beauty in our video below.